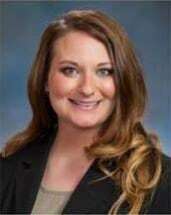 Jenny Vultaggio joined the firm in 2013, as a Law Clerk while attending the University of Denver School of Law. Ms. Vultaggio was admitted to the Colorado Bar in November 2015. She works in the areas of elder law, probate and estate planning. Ms. Vultaggio is a Denver native and received both her undergraduate degree and law degree from the University of Denver. During law school, Ms. Vultaggio was active in the Elder Law Society and was a member of the Criminal Law Review, serving as the journal's Managing Editor for two years, and assisted imprisoned clients through DU's Civil Rights Clinic where she was awarded as the Outstanding Student Attorney for the 2014-15 school year. Ms. Vultaggio also earned a certificate in Constitutional Rights and Remedies during her time at the Sturm College of Law. Ms. Vultaggio is a member of the National Academy of Elder Law Attorneys, the Colorado Bar Association's Elder Law and Trust and Estate Sections, and the Denver Bar Association. Ms. Vultaggio now resides in Castle Rock, Colorado with her husband Tony, daughter Vivienne and son Patrick. She and her family enjoy baking, camping, and hitting the beaches of San Diego every chance they can get.